UPC code (Universal Product Code) is the first large-scale application of the bar code, the United States unified code committee to develop a bar code for goods, mainly for the United States and Canada, after the passage of international trade. In principle, UPC code is produced by the manufacturer in the catalog after the production of goods to the local code committee to apply for approval after the trademark in the UPC system only identification code. A commodity corresponds to only a UPC, after the application of the manufacturer, the manufacturer has the right to change the use of UPC. 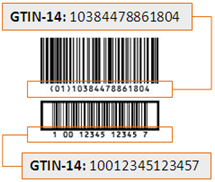 A UPC code is a 12-digit number with the bar code comprised of 7-bit codes that represent each digit in the sequence. There are exactly 30 bars in the UPC code sequence, including the start and end bars. The UPC code is read by a digital scanner that allows it to interpret each of these bars and match it up with a database for speedy check out.